Frankly, the calf muscles are insanely stubborn and a pain to grow, which is why most people stop focusing on them altogether. Genetics and a predisposition to explosive calf growth do play a surprisingly large role in that, but equally—if not more so—calf issues are predicated, uncalculated, half nature at which most people attack the muscle group. Because of that, they’ve become one of the biggest enigmas on the human body. People blast their calves into oblivion, with no results to show for it. Start training SMARTER and overhaul your calf strategy. It’s a valuable investment with an extremely high return and one that’s capable of completely transforming your lower body without doing much work whatsoever. The process is simple. Take 10 minutes of dedicated, progressive calf work onto the tail end of leg day and you’ll quickly gain muscles on the back side of your lower legs. Do it on a regular basis and you’ll gradually build mountainous and diamond-shaped calves. Successful calf development starts with an understanding of the anatomy and muscle fiber types involved, which directly influence the exercises, rep schemes and loads used. The calves are made up of two primary muscles — the gastrocnemius + soleus. The gastrocnemius is effectively the biceps of the lower body. It’s the visible muscle that bulges out of any pair of calves and conversely, is noticeably absent from smaller legs. It’s composed of 2 different heads (medial and lateral) that together create a diamond shape when grown out. 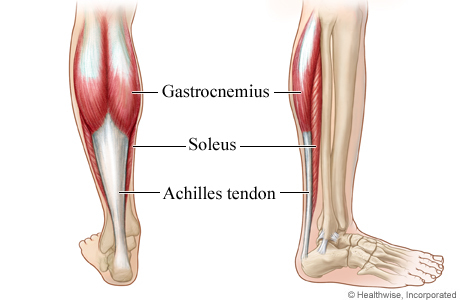 The soleus is a long, flat sheath of muscle tissue that runs down the back of the leg. It sits underneath the gastrocnemius and Achilles and because of that it isn’t actually visible. Even though the gastrocnemius is the calf muscle everyone see, the soleus is incredibly important. Aesthetically it adds height to the gastrocnemius and helps it pop out of the legs with 3D-like effect. It also specializes in endurance-based activities (more on that in a second) and works synergistically to improve the strength of your lower legs, which directly translates to accelerated growth. But there’s one key difference that has massive implications for calf training — muscle fiber types. The gastrocnemius is predominantly composed of fast-twitch fibers (FT), while the soleus is made up of slow-twitch fibers (ST). Translated for training purposes, FT fibers generate power and respond better to heavy loads; ST fibers are more conducive to endurance-based aerobic training and respond better to higher reps. Combine the two effectively—leveraging their individual attributes—and you’ll see growth skyrocket. But don’t worry, we’ve done the heavy lifting for you. The beauty of calves is that they’re a simple muscle to stimulate. Hit them hard and him them fast with a few key exercises and you’ll reap massive gains. They slide nicely into the back-end of any leg workout, and shouldn’t take up more than 10 minutes to thoroughly blast from a variety of angles. Straight-leg — all straight-leg exercises, usually done standing, primarily hit the gastrocnemius. They also hit the soleus, but to a smaller degree. Bent-leg — all bent-leg calf exercises, usually done sitting, almost exclusively work the soleus. It’s an easy pattern to keep track of, but ample balance is critical for effective results. As you’re training calves, aim to train both types of exercises. Don’t use momentum or bounce — the recoil takes most of the emphasis off the calf muscles (it displaces it to your Achilles). Always aim to increase the weight over time — go HEAVY. Use the foundational calf workout below to supplement your leg days—calf exercises ARE NOT a replacement for squats and lunges—and leverage all 4 power exercises below to keep growth consistent and fresh. Seated Calf Raises are THE best exercise to hammer the soleus directly. They have to be a staple in any leg and/or calf workout routine. (1) Load a plate machine. Sit upright with a tight core. (2) Powerfully contract your calves and press up as far as possible. Hold for 1 second and lower slowly all the way down to the bottom throughout the full ROM. You should feel a deep stretch through your calves. (3) Hold for 1 second at the bottom and repeat the movement. 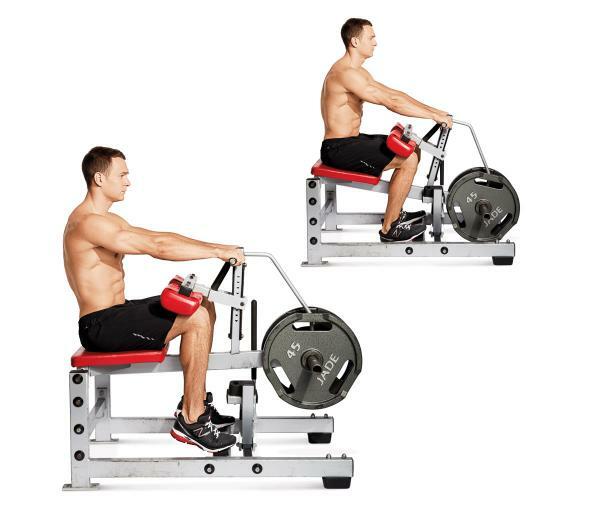 Variation(s): If you don’t have a plate-loaded calf machine, you can easily replicate the movement by placing two dumbbells on top of your quads (the front half).